People talk about URLs, URIs and URNs as if they're different things, but they look the same to the naked eye. What are the distinguishable differences between them? A URI can be further classified as a locator, a name, or both. The term "Uniform Resource Locator" (URL) refers to the subset of URIs that, in addition to identifying a resource, provide a means of locating the resource by describing its primary access mechanism (e.g., its network "location"). The term "Uniform Resource Name" (URN) has been used historically to refer to both URIs under the "urn" scheme [RFC2141], which are required to remain globally unique and persistent even when the resource ceases to exist or becomes unavailable, and to any other URI with the properties of a name. So all URLs are URIs (actually not quite - see below), and all URNs are URIs - but URNs and URLs are different, so you can't say that all URIs are URLs. Not "all URLs are URIs". It depends on the interpretation of the RFC. For example in Java the URI parser does not like [ or ] and that's because the spec says "should not" and not "shall not". So that muddies the waters further, unfortunately. If you haven't already read Roger Pate's answer, I'd advise doing so as well. 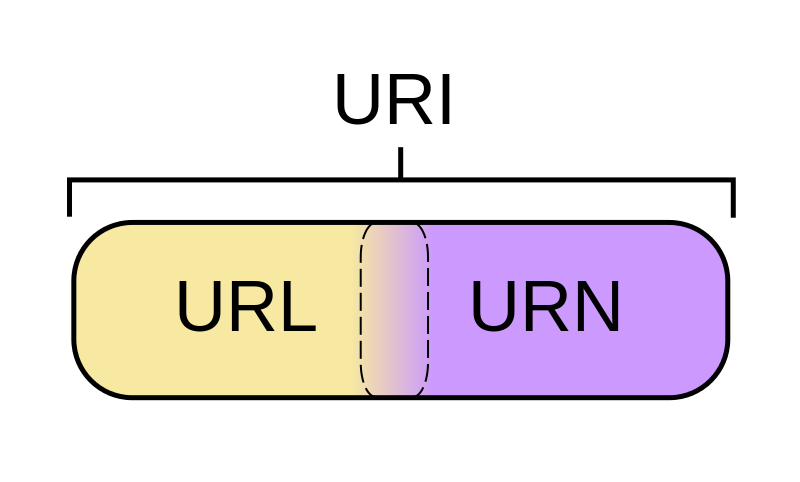 URIs identify and URLs locate; however, locators are also identifiers, so every URL is also a URI, but there are URIs which are not URLs. This is my name, which is an identifier. It is like a URI, but cannot be a URL, as it tells you nothing about my location or how to contact me. In this case it also happens to identify at least 5 other people in the USA alone. This is a locator, which is an identifier for that physical location. It is like both a URL and URI (since all URLs are URIs), and also identifies me indirectly as "resident of..". In this case it uniquely identifies me, but that would change if I get a roommate. I say "like" because these examples do not follow the required syntax. Because of this common confusion, many products and documentation incorrectly use one term instead of the other, assign their own distinction, or use them synonymously. My name, Roger Pate, could be like a URN (Uniform Resource Name), except those are much more regulated and intended to be unique across both space and time. Because I currently share this name with other people, it's not globally unique and would not be appropriate as a URN. However, even if no other family used this name, I'm named after my paternal grandfather, so it still wouldn't be unique across time. And even if that wasn't the case, the possibility of naming my descendants after me make this unsuitable as a URN. URNs are different from URLs in this rigid uniqueness constraint, even though they both share the syntax of URIs. URIs are a standard for identifying documents using a short string of numbers, letters, and symbols. They are defined by RFC 3986 - Uniform Resource Identifier (URI): Generic Syntax. 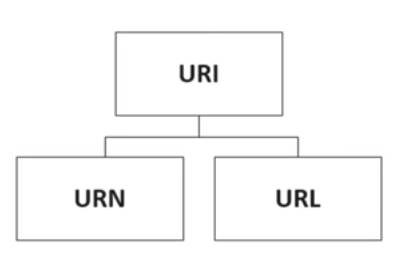 URLs, URNs, and URCs are all types of URI. URLs always start with a protocol (http) and usually contain information such as the network host name (example.com) and often a document path (/foo/mypage.html). URLs may have query parameters and fragment identifiers. urn:isbn:0451450523 to identify a book by its ISBN number. urn:publishing:book - An XML namespace that identifies the document as a type of book. URNs can identify ideas and concepts. They are not restricted to identifying documents. When a URN does represent a document, it can be translated into a URL by a "resolver". The document can then be downloaded from the URL. Rather than locating it on the internet, or naming it, data can be placed directly into a URI. An example would be data:,Hello%20World. I've heard that I shouldn't say URL anymore, why? The W3 spec for HTML says that the href of an anchor tag can contain a URI, not just a URL. You should be able to put in a URN such as <a href="urn:isbn:0451450523">. Your browser would then resolve that URN to a URL and download the book for you. Do any browsers actually know how to fetch documents by URN? Not that I know of, but modern web browser do implement the data URI scheme. Does the difference between URL and URI have anything to do with whether it is relative or absolute? Does the difference between URL and URI have anything to do with whether it has query parameters? Does the difference between URL and URI have anything to do with whether it has a fragment identifier? Does the difference between URL and URI have anything to do with what characters are permitted? No. URLs are defined to be a strict subset of URIs. If a parser allows a character in a URL but not in a URI, there is a bug in the parser. The specs go into great detail about which characters are allowed in which parts of URLs and URIs. Some characters may be allowed only in some parts of the URL, but characters alone are not a difference between URLs and URIs. But doesn't the W3C now say that URLs and URIs are the same thing? Yes. The W3C realized that there is a ton of confusion about this. They issued a URI clarification document that says that it is now OK to use the terms URL and URI interchangeably (to mean URI). It is no longer useful to strictly segment URIs into different types such as URL, URN, and URC. Can a URI be both a URL and a URN? The definition of URN is now looser than what I stated above. The latest RFC on URIs says that any URI can now be a URN (regardless of whether it starts with urn:) as long as it has "the properties of a name." That is: It is globally unique and persistent even when the resource ceases to exist or becomes unavailable. An example: The URIs used in HTML doctypes such as http://www.w3.org/TR/html4/strict.dtd. That URI would continue to name the HTML4 transitional doctype even if the page on the w3.org website were deleted. 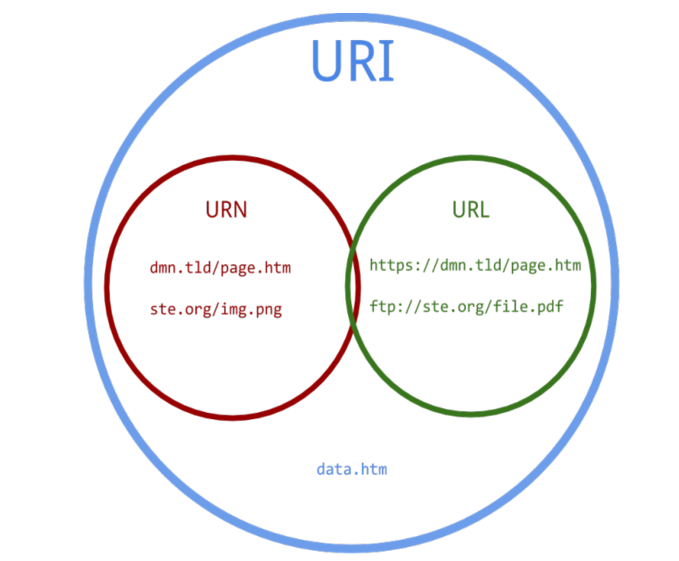 In summary: a URI identifies, a URL identifies and locates. Consider a specific edition of Shakespeare's play Romeo and Juliet, of which you have a digital copy on your home network. You could identify the text as urn:isbn:0-486-27557-4. That would be a URI, but more specifically a URN* because it names the text. You could also identify the text as file://hostname/sharename/RomeoAndJuliet.pdf. That would also be a URI, but more specifically a URL because it locates the text. Put simply, URL is the full way to indentify any resource anywhere and can have different protocols like FTP, HTTP, SCP, etc. URI is a resource on the current domain, so it needs less information to be found. In every instance that CodeIgniter uses the word URL or URI this is the difference they are talking about, though in the grand-scheme of the web, it is not 100% correct. First of all get your mind out of confusion and take it simple and you will understand. URI => Uniform Resource Identifier Identifies a complete address of resource i-e location, name or both. URL => Uniform Resource Locator Identifies location of the resource. This is one of the most confusing and possibly irrelevant topics I've encountered as a web professional. As I understand it, a URI is a description of something, following an accepted format, that can define both or either the unique name (identification) of something and its location. There are two basic subsets - URLs, which define location (especially to a browser trying to look up a webpage) and URNs, which define the unique name of something. I tend to think of URNs as being similar to GUIDs. They are simply a standardized methodology for providing unique names for things. As in the namespace declarative that uses a company's name - it's not like there is a resource sitting on a server somewhere to correspond to that line of text - it simply uniquely identifies something. I also tend to completely avoid the term URI and discuss things only in terms of URL or URN as appropriate, because it causes so much confusion. The question we should really try answering for people isn't so much the semantics, but how to identify when encountering the terms whether or not there is any practical difference in them that will change the approach to a programming situation. For example, if someone corrects me in conversation and says, "oh, that's not a URL it's a URI" I know they're full of it. If someone says "we're using a URN to define the resource" I'm more likely to understand we are only naming it uniquely, not locating it on a server. If I'm way off base - please let me know! urn: and : stand for themselves. Amazon Resource Names (ARNs) is a uniquely identify AWS resources. :,//,? and # stand for themselves. To reach a person: Driving(protocol others SMS, email, phone), Address(hostname other phone-number, emailid) and person name(object name with a relative path). URL's are a subset of URI's (which also contain URNs). Basically, a URI is a general identifier, where a URL specifies a location and a URN specifies a name. In this case com.mycompany.mynode would be a URI that uniquely identifies the "myPrefix" namespace for all of the elements that use it within my XML document. This is NOT a URL because it is only used to identify, not to locate something per se. Due to difficulties to clearly distinguish between URI and URL, as far as I remember W3C does not make a difference any longer between URI and URL (http://www.w3.org/Addressing/). They're the same thing. A URI is a generalization of a URL. 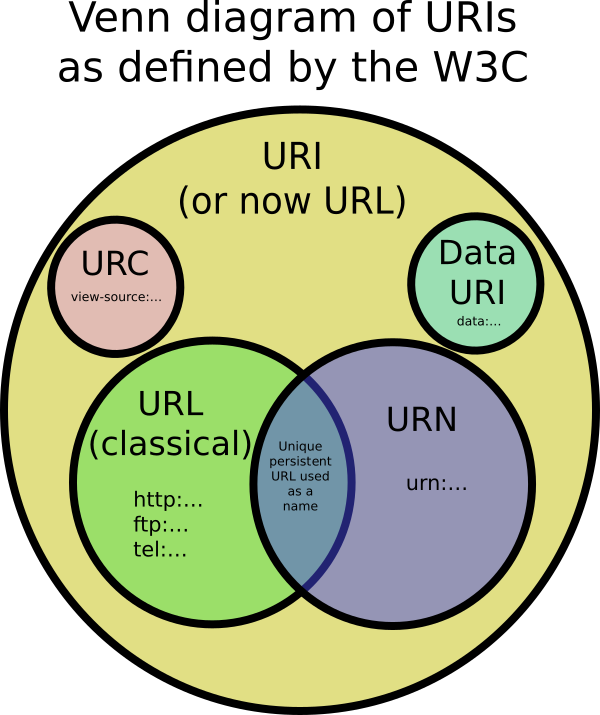 Originally, URIs were planned to be divided into URLs (addresses) and URNs (names) but then there was little difference between a URL and URI and http URIs were used as namespaces even though they didn't actually locate any resources. A Uniform Resource Identifier (URI) is a compact sequence of characters that identifies an abstract or physical resource. A URI can be further classified as a locator, a name, or both. The term “Uniform Resource Locator” (URL) refers to the subset of URIs that, in addition to identifying a resource, provide a means of locating the resource by describing its primary access mechanism (e.g., its network “location”). URI is kind of the super class of URL's and URN's. Wikipedia has a fine article about them with links to the right set of RFCs. A URL is a URI that, in addition to identifying a resource, provides means of acting upon or obtaining a representation of the resource by describing its primary access mechanism or network "location". A URL is a specialization of URI that defines the network location of a specific resource. Unlike a URN, the URL defines how the resource can be obtained. We use URLs every day in the form of http://example.com etc. But a URL doesn't have to be an HTTP URL, it can be ftp://example.com etc., too. A URI identifies a resource either by location, or a name, or both. More often than not, most of us use URIs that defines a location to a resource. The fact that a URI can identify a resources by both name and location has lead to a lot of the confusion in my opinion. A URI has two specializations known as URL and URN. A URI is an identifier for some resource, but a URL gives you specific information as to obtain that resource. A URI is a URL and as one commenter pointed out, it is now considered incorrect to use URL when describing applications. Generally, if the URL describes both the location and name of a resource, the term to use is URI. Since this is generally the case most of us encounter everyday, URI is the correct term. The URI describes the protocol for accessing a resource (path) or application (query) on a server (authority). All the URLs are URIs, and all the URNs are URIs, but all the URIs are not URLs. A URL is a specialization of URI that defines the network location of a specific resource. Unlike a URN, the URL defines how the resource can be obtained. We use URLs every day in the form of http://stackoverflow.com, etc. But a URL doesn’t have to be an HTTP URL, it can be ftp://example.com, etc. Although the terms URI and URL are strictly defined, many use the terms for other things than they are defined for. This might be the reason for some of the confusion. a URL is a type of URI that identifies a resource via a representation of its primary access mechanism (e.g., its network "location"), rather than by some other attributes it may have. It's not an extremely clear term, really. After reading through the posts, I find some very relevant comments. In short, the confusion between the URL and URI definitions is based in part on which definition depends on which and also informal use of the word URI in software development. As web developers and programmers we will almost always be concerned with URL and therefore URI. Now a URL is specifically defined to have all the parts scheme:scheme-specific-part, like for example https://stackoverflow.com/questions. This is a URL and it is also a URI. Now consider a relative link embedded in the page such as ../index.html. This is no longer a URL by definition. It is still what is referred to as a "URI-reference" [RFC2396]. I believe that when the word URI is used to refer to relative paths, "URI-reference" is actually what is being thought of. So informally, software systems use URI to refer to relative pathing and URL for the absolute address. So in this sense, a relative path is no longer a URL but still URI. URN: unique resource name, i.e. "what" (eg urn:issn:1234-5678 ). This is meant to be unique .. as in no two different docs can have the same urn. A bit like "uuid"
URI: can be either a URN or a URL. This fuzzy definition is thanks to RFC 3986 produced by W3C and IETF. I was wondering about the same thing and I've found this: http://docs.kohanaphp.com/helpers/url. URIs came about from the need to identify resources on the Web, and other Internet resources such as electronic mailboxes in a uniform and coherent way. So, one can introduce a new type of widget: URIs to identify widget resources or use tel: URIs to have web links cause telephone calls to be made when invoked. Some URIs provide information to locate a resource (such as a DNS host name and a path on that machine), while some are used as pure resource names. The URL is reserved for identifiers that are resource locators, including 'http' URLs such as http://stackoverflow.com, which identifies the web page at the given path on the host. Another example is 'mailto' URLs, such as mailto:fred@mail.org, which identifies the mailbox at the given address. URNs are URIs that are used as pure resource names rather than locators. For example, the URI: mid:0E4FC272-5C02-11D9-B115-000A95B55BC8@stackoverflow.com is a URN that identifies the email message containing it in its 'Message-Id' field. The URI serves to distinguish that message from any other email message. But it does not itself provide the message's address in any store. URL is your address with your name in-order to communicate with you. my address is TN, Chennai 600001.
in the above you can communicate with a page called firstpage.html (URI) using following http://www.google.com/fistpage.html(URL). Hence URI is subset of URL but not vice-versa. Even if StackOverflow would allow me to hyperlink to the s3:// protocol scheme, it wouldn't do you any good in locating the resource. Because it Identifies a Resource, fig. 1 is a valid URI. It is also a valid URN, because Amazon requires that the bucket (their term for the authority portion of the URI) be unique across datacenters. It is helpful in locating it, but it does not indicate the datacenter. Therefore it does not work as a URL. So, how do URI, URL, and URN differ in this case? The most common URI is the Uniform Resource Locator (URL) which identifies an Internet domain address. Another, not so common type of URI is the Universal Resource Name (URN). An Uniform Resource Locator (URL) is the term used to identify an Internet resource including the scheme( http, https, ftp, news, etc.). For instance What is the difference between a URI, a URL and a URN? In Java servlets, the URI frequently refers to the document without the web application context. Not the answer you're looking for? Browse other questions tagged http url uri urn rfc3986 or ask your own question. What is the difference between URI, URL and URN? Difference between URL and URI? Where is the difference between locating and identifying a resource? What is the difference between a URI and URL? What's difference between URL,URN and URI?